On Sunday 19th August the Mid Suffolk Light Railway unveiled the latest addition to the Middy collection, completely refurbished 1933 Dennis Mace lorry, now fitted with a Dennis engine and after many years again operational. Following an introduction by Middy Chairman John Stark, the guest of honour Mr. Roger Heard OBE, retired Sales Director of Dennis Bus & Fire Engine Co., addressed the crowd of visitors on the history of the Dennis Company, now mainly involved in international bus manufacturing. 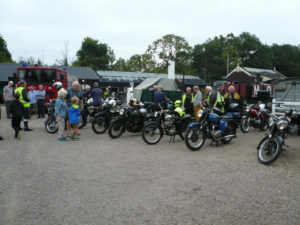 The Middy was also visited during the day by some 20 plus members of the Norwich Vintage Motorcycle Club, two traction engines and a Dennis fire Engine. The Dennis Mace makes a very welcome addition to the Middy collection, albeit an example of the competition that finally put paid to the railway.